If a band is your way to start feeling at home in a new provincial town, my friend, it will give you a set of wings. That’s what it did to us! Deventer was and still is one of the most beautiful small cities of the Netherlands. First of all because it’s historic scenery with magnificent buildings in the centre of town, the river site of the IJssel and a variety of pubs and venues, most oriented to the large amount of students that came over to study but we are talking about the 80’s here. There were all kind of possibilities to play as a band, to rehearsal or to go out and watch others play. There were no clear limitations for the amount of dB’s, punk rock bands would scream your ears to pieces while you try to find your way to the bar through a thick mist of cigarette smoke. There were no clear alcohol use limitations and because of the unemployment those days there was a lot of action in the streets at night. For Nar-Cist these were the optimal ingredients and ambition for writing their own songs, the use of their own experiences and views made it sure that they had their own follow-up along students but also along other musicians and music lovers. It didn’t take that long for gigs to take place in venues like de SAAM, de Steile Trap, but most special where Het Burgerweeshuis and Het Zaut der Aarde. 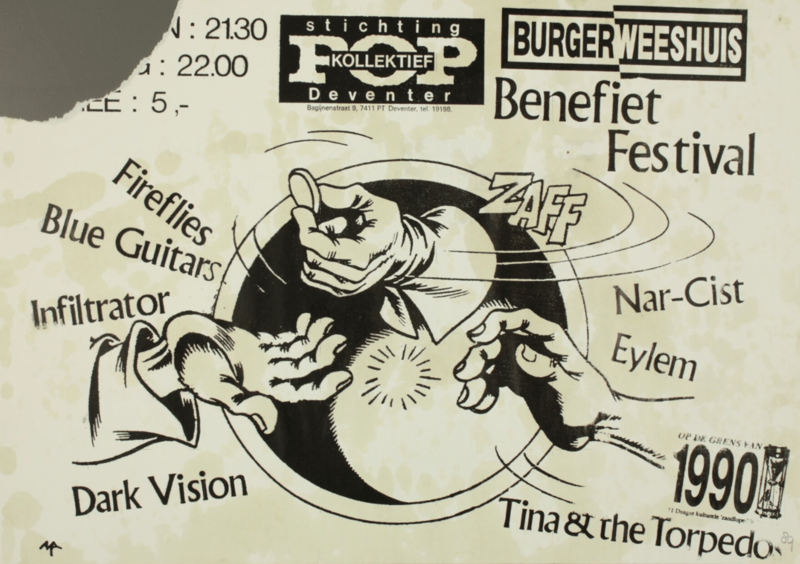 Het Burgerweeshuis was the most important venue in the region and it was also the place where we did our reharsels. Musicians where organized in the so called Popkollektief that gave bands the chance to do their first gigs, do support acts and play on local festivals. Het Burgerweeshuis was a great venue to play for us. Het Zaut der Aarde came along later on, and even if the venue sounded like a Greek aquarium, we did our thing there and had a great time. Yes Deventer was and is again our home base. PreviousAre you christian punks or something?